Slovenian pianist Kaja Draksler, Swedish double bass player Petter Eldh, and German drummer Christian Lillinger founded their trio Punkt.Vrt.Plastik at the Bimhuis in Amsterdam, where they played a completely improvised set at the famous October Meeting in 2016. Their name is composed of “Punkt“, which represents a view and a musical statement for Petter Eldh (it’s Swedish for “point“), “Vrt“, the Slovenian word for garden and according to Draksler the place where the musical philosophies are planted and cultivated, and “Plastik“ (German for “plastic“), for Christian Lillinger the symbol of plasticity of musical forms and structures. After I had seen them at the Just Music Festival in Wiesbaden in February this year, I couldn’t wait for their debut album, however it was announced only for November. They had played a spectacular gig displaying a cornucopia of idiosyncratic, weird hook lines, harmonic shifts and unpredictable percussive ingredients. Yet, when the CD arrived and I listened to it for the first few times, the magic of the concert somehow wasn’t there anymore. When I recently heard the trio at Schorndorf’s Manufaktur though, I was blown away again. Do they just feel more comfortable in a live context than in a rather confined studio atmosphere (the album was recorded at the Loft in Cologne)? Can they just take higher risks live when they are able to let themselves go on the basis of preconceived ideas? After the Schorndorf gig I’ve listened to the CD over and over again and I’ve found a different access to it. In this band three very different musical personalities crash into each other, at first sight contradictory, yet also consistent. “I was both excited and scared of the power Christian and Petter have together as a rhythm section. It’s like riding a wave,“ says Draksler in the very insightful liner notes by Peter Margasak. On the album the power of the rhythm section is guided by the compositions, they set a certain direction, Draksler’s improvisations are less exuberant. The music here is like the essence of the live gigs. 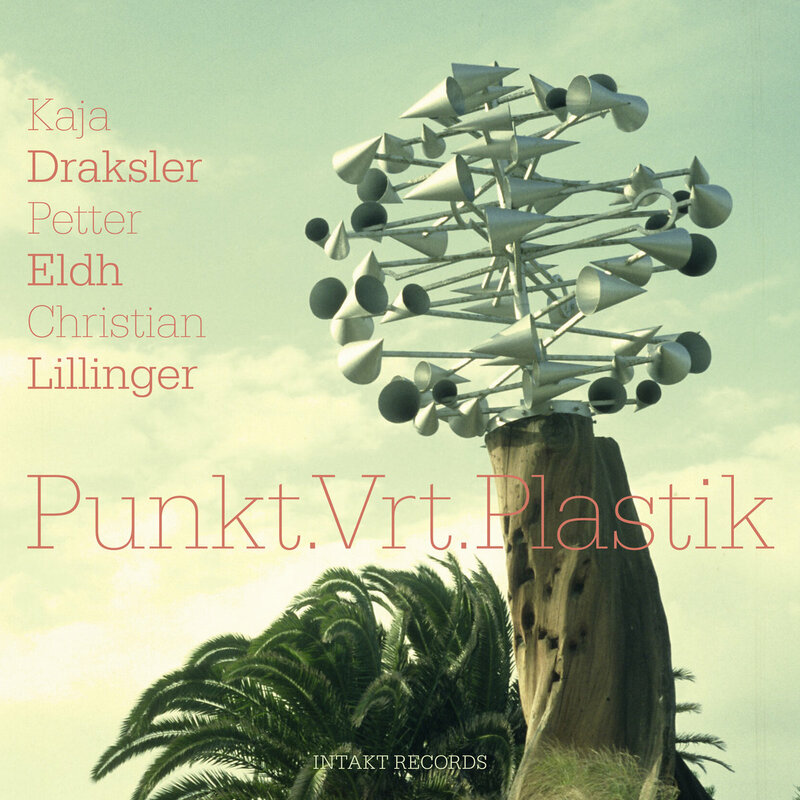 One of the most interesting aspects on Punkt.Vrt.Plastik is Eldh’s and Lillinger’s different approach as to time. While Eldh is rather grounded and robust, Lillinger is busy and incredibly dynamic. They seem to constantly negotiate where the music should go to, based on a common ground of musical phrases in general. This allows Draksler to find her space, her style being structurally unusual with its intricate counterpoint melodies and rhythmical motives (see “Life Is Transient“, that comes across like a Bach piece). This is also obvious in Christian Lillinger’s “Nuremberg Amok“, in which the melody played by the piano is literally shredded and torn apart. Occasionally it reappears in different shapes, while the drums quote hiphop beats suggesting a groove, but actually Lillinger just dissembles time varying rhythmic cells, which brings his approach close to postmodernism. Eldh is the one who holds this fraying structure together with his rootsy, powerful playing and with his steady presence, which in turns allows Draksler to create crystal clear melodies zigzagging between the twitching pulse. Another example of the band’s outstanding qualities is Draksler’s composition “Evicted“, which directs the energy of the rhythm section with frugal chords. Lillinger and Eldh throw in sudden stops and starts, the bass even taking the lead as to melody. The piano is reduced to essentials, the chords are stripped to the very bare, they’re free of any mannerism. Finally, Draksler contrasts extremely low and high notes, she carries the dynamics and the folksy melody all by herself, bass and drums drop out. This extreme reduction creates a somber atmosphere - another characteristic of the album. In general, the pieces morph and stretch forms and grooves, the music is constantly coloured anew. This is a very exciting band - both live and in the studio. Draksler, Eldh and Lillinger are among the most thrilling and promising figures in today’s European improvising scene, hopefully Punkt.Vrt.Plastik is not just a one time thing. It’s one of the best albums this year.